Our buggies have rolled over rocks, thick sand, cacti and through rivers and waves. When we reached Andreas Staehelin’s place in Baleia (paradise) we were glad to spend a day cleaning and maintaining the buggies (and ourselves!) ready for the final section of the adventure. We also spent a day swapping sports with the kite surfers. Charlie and I spent the morning being dragged around in the atlantic waves under the instruction of kite surfing adventurer Louis Tapper, and in the afternoon trailered our buggies to huge dunes east of Baleia to show the surfers what buggying was about. 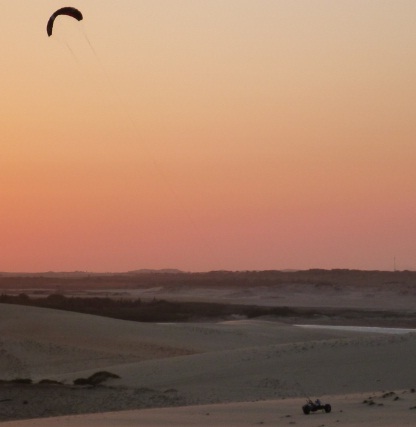 It was an epic session and they were still ripping around the dunes under the power of our ozone kites until after sunset. The wind was still strong, so we kited the 5km back to Andreas house by moonlight, almost crashing into sleeping cows and zipping through streams on the beach. We’re aiming to cover 50km and reach the fishing village of Icaraizinho tomorrow. 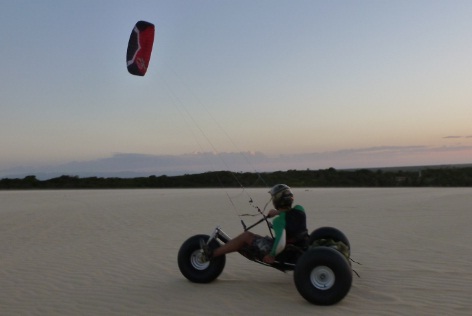 This entry was posted in Buggies, Computer Solutions, Gear, Journal, Kites, Ozone, Sponsors by Harry Thuillier. Bookmark the permalink. Andar en buggy por la playa libremente no tiene precio y vale cualquier esfuerzo…….y si terminan en buena compania mejor,,,,Suerte y sigan contando su viaje….. 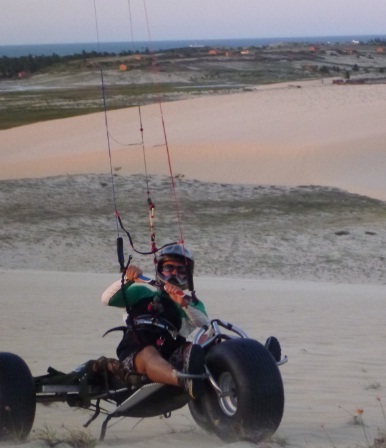 Walking on the beach buggy freely priceless and worth any effort ……. and if they end up in good company better,,,, Luck and keep telling your trip …..